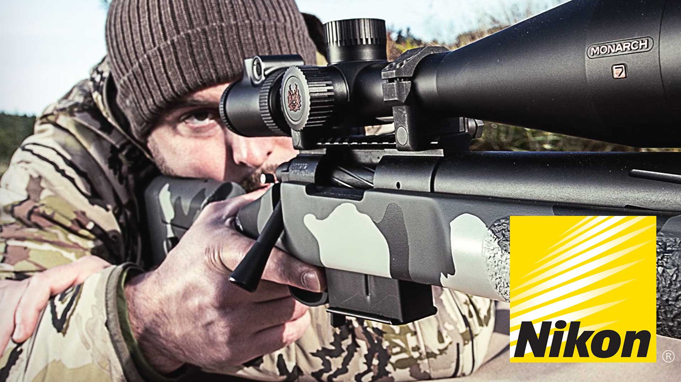 ABOVE : New from Nikon is the flagship Monarch 7 line, which includes the 3-12x56mm IL Advanced BDC scope seen here. Nikon's IL Advanced BDC w/Dot reticle features an illuminated center dot, BDC hold-over points and windage/lead reference marks. Nikon currently offersfive models in the Monarch 7 line: 2.5-10x50mm Advanced BDC, 3-12x56mm Advanced BDC, 3-12x56mm IL Advanced BDC, 4-16x56mm Advanced BDC and 4-16x56mm IL Advanced BDC. The sample I tested was the 3-12x56mm IL Advanced BDC with Dot. The 3-12X magnification range and large 56mm objective is a traditional European style. Built on a 30mm tube, it has pleasing lines and is an attractive optical device. But what does it actually bring to the table? It is 14.3 inches long, but even with that fat 56mm objective, it weighs in at only 25.8 ounces. So it's not overly rotund and is considerably lighter than models built on 34mm tubes. Nikon's low-profile finger-adjustable turrets feature precise audible and tactile 1/4 m.o.a. adjustments. One full revolution provides an impressive 24 m.o.a. of adjustment with 78 m.o.a. available. The turrets are clearly marked, and full turret revolution lines allow you to easily keep track of how much elevation/ windage you've dialed in. On the leftside of the mechanism block is a side-focus knob. This allows parallax to be eliminated and is more conveniently placed than a traditional adjustable objective. Pull it straight out to unlock it and then rotate it to the desired position. Pushing it back in locks it in place so it cannot be accidentally rotated. This is a useful feature, especially for hunting. Unlike most of its competition, the Monarch 7's illumination system does not feature a conventional rheostat located on the mechanism block. Instead, Nikon incorporates a microprocessor-controlled illumination system above the eyepiece. A button on the left side decreases intensity while one on the right increases it. 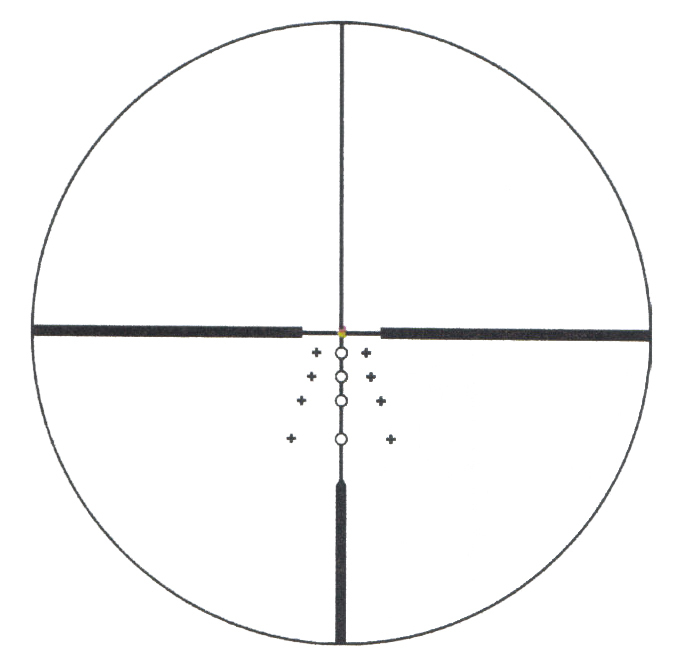 A center aiming dot, rather than the entire reticle, is illuminated. Intensity is bright enough, when turned all the way up, to clearly see it in bright daylight. The circles feature an inside diameter of 1.5 m.o.a. and an outside diameter of 2 m.o.a. They offer 2,4.5, 7 and 11 m.o.a. of compensation while the top of the vertical post provides 15 m.o.a. If you know the drop of your load, you can easily plot your trajectory in relation to Nikon's BDC reticle. Roughly, the reticle will provide aiming points from 100 to 500 or so yards for standard velocity cartridges and out to 600 or so yards for magnums. But what if you don't know your load's trajectory? Or perhaps you'd like to compare different loads? No problem. Nikon developed a ballistic software program called Spot On. Simply go to NIKONSPORTOPTICS.COM, click on Products, then Hunting to find the Spot On page. It's very easy to use, allows you to print out custom hold-over/windage charts for whatever magnification you desire, and best of all, it's free. It took me about a minute to log into Spot On, figure it out and print a custom hold-over chart for my caliber and load of choice for both 6X and 12X. You can even get an app for your mobile device to take it with you to the range. So Nikon has made things fairly easy regarding bullet drop and windage. Magnification features a fourfold increase, and I'm a fan of the 3-12X magnification range for field use because I've found it to be practical. When set on 3X the Nikon provides a wide field of view (39.4 feet at 100 yards), a huge exit pupil and a forgiving eye box. This makes it well suited for rapid snap shots at moving targets.